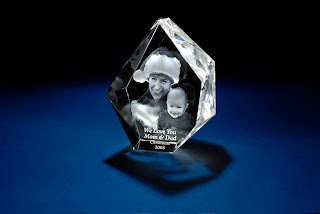 3D Laser Gifts specializes in custom, laser-etched, 3D crystal keepsakes to make your gifts unique, beautiful and "from the heart". Using state of the art laser engraving technology, any image, logo or design can be engraved onto a beautiful crystal canvas creating a long lasting, one of a kind gift for any occasion. The crystals come in various shapes and sizes and feature options to add text such as a dedication or a name.